the Digital Transformation is unstoppable. We interact with algorithms every day – voluntarily and involuntarily. Sometimes this is good for us, sometimes it is not. In each case we cannot escape this reality. Not only in our  blog  but also in the real world  we want to shape the Digital Transformation together with you! With our symposium “Mensch-Sein mit Algorithmen/ Being Human with Algorithms” we address key topics of today’s discussion on the Digital Transformation, such as Artificial Intelligence, Algorithm Ethics, Big Data, Internet of Things, Autonomous Driving, Social Responsibility, Robot Assisted Living, Industry 4.0, Privacy, and many more. The topic concerns each one of us, also you! It is highly relevant that we as society discuss about these topics now! It is our future and the Digital Transformation affects everything in it! We have to shape our Digital Transformation or others will do so. Vint Cerf (Google), who literally invented the infrastructure you are using every day, the Internet. Prof. Dr. Martin Hellman (Stanford), who invented central security mechanisms that make our digital lives safer, and who is very engaged in highly relevant topics such as denuclearization. Though definitely being a highlight, the other speakers and the exhibition definitely do not have to hide behind the two! 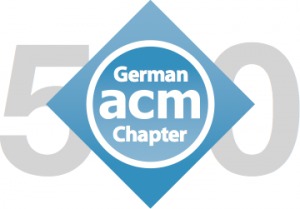 As ACM member you can apply for free tickets  that are kindly sponsored by the ACM Europe Council (CECL). We have reduced tickets available for those only wanting to spend the Thursday evening only , for listening to Vint Cerf (Google), one of the fathers of the Internet who will tell us something about the “Unfinished Internet“. We have full tickets available  for those also wanting to hear the interesting viewpoints of Martin Arend (BMW), Katharine Jarmul (KIProtect), Prof. Dr. Peter Weibel (ZKM), Prof. Dr. Michael Strube (HITS), Prof. Dr. Martin Hellman (Stanford), Prof. Dr. Alexander Filipovi&cacute; (Hochschule für Philosophie), and Prof. Dr. Franziska Boehm (Leibniz-Institute for Information Infrastructure). For those of you joining Friday , I am very happy that besides fantastic talks we will have a satellite exhibition from the ZKM at the Studio Villa Bosch that will be introduced by one of the artists, Dr. Bernd Lintermann (ZKM)! The Digital Transformation happens now, and it should not happen without us – let’s shape it together! Come to the symposium!